With whimsical colorful stripes, their unique markings give them the name Clown Tang, Lined Tang, or Blue-lined Surgeonfish! With the upper three quarters of its body being banded alternately with black-edged blue and yellow stripes, the Clown Tang or Lined Tang is truly a unique and intriguing looking tang. Unfortunately this most unusual looking fish has a reputation for being hard to keep in captivity. The Clown Tang gets rather large, reaching 11 inches (28 cm) as adults. They also have a reputation for being quarrelsome with each other and other fish. They can be aggressive and territorial so only keep one per aquarium. Video in a temporary holding tank to show the size and beauty of the Clown Tang. One thing nice about this video is that we get such a good look at the Clown Tang! The beautiful multicolor stripes, white belly and lemony yellow fins! These are wonderful tangs with high energy, needing a tank that is at least 250 gallons that is highly oxygenated and very clean! These tangs are for experts only due to their need to be in a very clean tank with serious water movement and filtration that can rival their massive output of poo! The Marshall Islands Clown Tang has a different coloring. Insanely beautiful Clown Tang from Sri Lanka in acclimation basket. The Clown Tang or Lined Tang, Acanthurus lineatus, comes in various color morphs depending on location. This beautiful fish is from Sri Lanka and has much more blue and what looks like even green and orange in their coloring which is different from the yellow and blue Marshall Island variant. If you have a 250 gallon tank or larger with great filtration, low nitrates, serious oxygenation, and you are an expert aquarist, I highly suggest picking one up! The basket is used for several days to acquaint the fish with others in the tank and make sure it is feeding properly before adding to the main display. GORGEOUS! 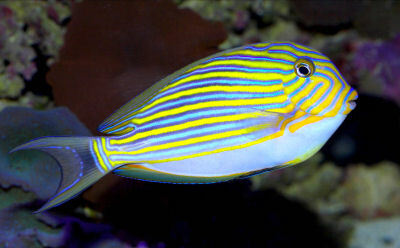 Maintenance difficulty: The Clown Tang, Lined Tang, or Blue-lined Surgeonfish is difficult to keep. Habitat: Natural geographic location: Clown Tang, Lined Tang, or Blue-lined Surgeonfish are found throughout the Indo-Pacific from east Africa to the Marquesas at depths up to 15 meters..
Foods: Mainly found grazing on filamentous algae. Social Behaviors: Lives singly or small groups with a territorial male and several females. It is known as an aggressive fish even to the aquarium keeper. Sexual differences: Males grow larger than females. Light: Recommended light levels: Found in areas with sunlight. Minimum Tank Length/Size: A minimum 75 gallon aquarium is recommended. Water Movement: Weak, Moderate, Strong Appreciates moderate water movement. Availability: The Clown Tang or Lined Tang are occasionally available at retailers. They are priced about $40.00 USD and up. Hi my name is jason and I live in south africa. My friends stepdad caught a powder blue surgeon long ago it was already transparent and later turned back to its normal colors. tallulah is the name of our very lively healthy clown tang. (although maybe borris is her name ...how do you know if its a male or female ??) anyway , royal of the tank it is. Likes to hang out with clowne fish, and isnt scared to tease simon, the banded shrimp. Likes to shelter in the biggest cave, and will makes her head turn black when feeling territorial. Extremely fast swimmer , loves her food and has a good sense of humour. I bought a young clown tang a couple of months ago. It has about doubled in size, and just now starting to show some aggressive tendencies. But the odd thing about the fish is that it has become translucent. You can see the abdominal sack clearly as silver. Also, you can see the bone structure. I have never seen anything like this in a tang before. Has anyone else?